Every great team has an even greater captain. The Lakers had Kobe Bryant, the Avengers have Captain America, And The Filharmonic has Jules Cruz. Jules is the foundation of the group in terms of leadership and singing part which is vocal bass. Jules went to Mt. San Antonio College where he studied Environmental Biology. He too has performed with Avi Kaplan while singing for Mt. Sac’s Chamber Choir. Some even say that Jules skills as an entertainer are drawn from his upbringing in Henderson, Nevada, which is a stone's throw away from the western hemisphere’s biggest stage, Las Vegas. Before singing full time with The Filharmonic, some of his previous occupations consisted of a train conductor, wildlife sanctuary attendant, and sandwich artist. Trace Is The Filharmonic’s personal social media wiz and video editing savant. Although he is originally born and raised in Chicago, Illinois, these techy skills he acquired are from the University of Southern California, where he graduated with a degree in Broadcast and Digital Journalism. Prior to singing with The Filharmonic, he was holding the esteemed title of Musical Director for his a cappella group, the USC Troy Tones. Although he illustrates a boyish demeanor onstage, Trace is very business minded and takes a lot of pride in The Filharmonic’s social presence. So if you ever get a heartfelt reply or a cute emoji, chances are you can thank Trace for that. His fat beats can only be rivaled by his long, luscious hair. You may have heard others call him "The Bad Boy" of the group but that is only because he marches to the beat of his own drum (pun intended). In actuality Niko isn’T a law breaker but an aspiring Law Enforcement Officer with his degree in Political Science that he earned from the University of California, Riverside. You can see his hip hop rooted personality through his unique style of beatboxing and his street inspired fashion choices. The group also considers him the best dancer which could be a result from his love of 90'S Hip Hop. When he isn’t working on his rhythms you can find him working it out at the gym. Protein Protein Protein!! The Filharmonic, an LA-based a cappella group of Filipino-American youngsters who were featured in NBC’S hit musical competition, The Sing-Off, has much to sing about. The 5-piece vocal group made the semi-finals, joined The Sing-Off national tour, and were featured in the Universal Pictures hit movie, Pitch Perfect 2, setting off a viral sensation after their Late Late Show appearance. In 2016, The Filharmonic brings their unique blend of hip hop, pop and 90'S nostalgia to more than 150 college stages nationwide and was named the #1 college booked entertainment group of the year. Joe Caigoy is the big cuddly bear of the group! 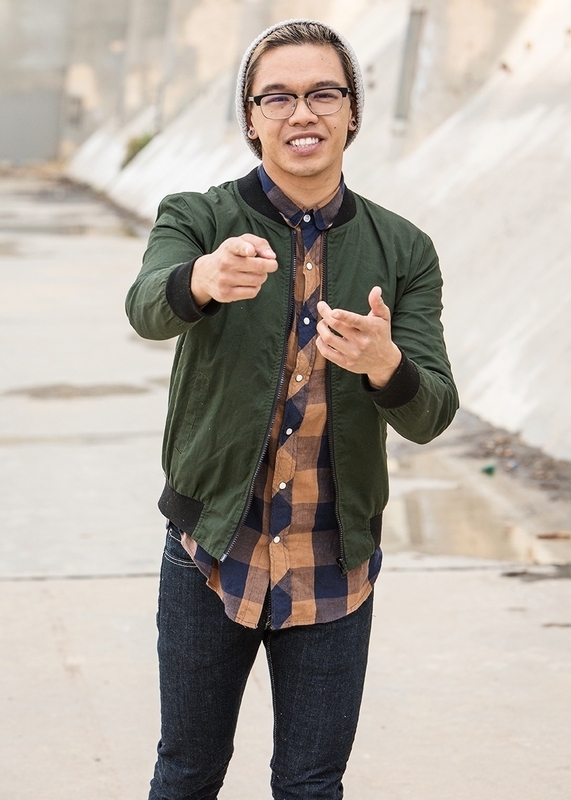 His voice has been given many nicknames during The Filharmonic’s journey on The Sing Off, ranging from “The Voice of God” to “Chocolate Covered Strawberries”. Joe brings a lot to the table in terms of vocal variety. Not only was he a part of Mt. Sac’s winning ICCA group in 2009 (Alongside Pentatonix’s Avi Kaplan), he also has merits in both vocal jazz and opera. However his diversity doesn’t stop there. Joe was born to perform and was even praised by Jewel for his sultry body roll choreography on the show. Studying vocal performance at Michigan State University, Joe hopes to become a music educator someday. Being the driving force behind The Filharmonic’s soothing melodic sound, the group is very fortunate to call Vj their “Musical Director”. Since graduating with a Bachelors of Music degree in Choral – Vocal, Jazz studies from Cal State, Long Beach, Vj has had a variety of accomplishments in the music industry such as being a contestant on Season 3 Of NBC’s The Voice. In addition to that, he is considered to be an expert in the World of A Cappella and has a yearly mentoring position at the famed A Cappella Academy which is run by Ben Bram and Avi Kaplan of Pentatonix. Even though Vj is working round the clock on numerous projects you might be able to find him on his downtime watching Netflix or jamming out to Beyonce and Fifth Harmony. Happy Easter from The Fillies! !